Have you ever wanted to try scuba diving? Not quite ready to take the plunge into a certification course? 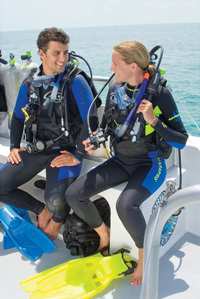 Discover Scuba Diving will let you try scuba to see if you like it. 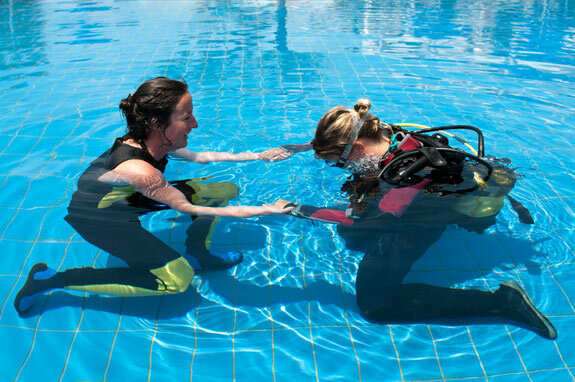 Our friendly instructors will give you a great experience in our on-site pool. While not an actual scuba certification, during the experience you’ll learn how to use scuba equipment in shallow water and get a quick and easy introduction to what it takes to explore the underwater world. Bring a friend or organize a group splash party! Aquaventure Dive & Photo can arrange group programs for Girl Scouts, Boy Scouts and other youth groups! We also have programs for kids who are 8 to 12-years-old. Aquaventure supplies all the gear you need, just bring your bathing suit and towel. The PADI Open Water Diver certification course. Complete a Discover Scuba Diving Participant Statement. (PDF) Any “Yes” responses on the medical questionnaire will require your physician sign a PADI Medical Statement – 10063 (PDF) stating that you are fit to dive.